We buckle up. Why shouldn't our best friends? "Minimize driving distractions and increase protection for both you and your dog. Bergan's harnesses meet V9DT B2009.1. Pet Safety Durability Test (see www.v9dt.com). The minimum durability thresholds are designed to ensure confidence that a harness will withstand forces generated from sudden stops while minimizing distractions from traveling pets. A sudden stop in an accident might cause your dog to fly through the air and possibly run away. The complete harness system comes equipped with adjustable safety tether and two high-grade aluminum carabineers. 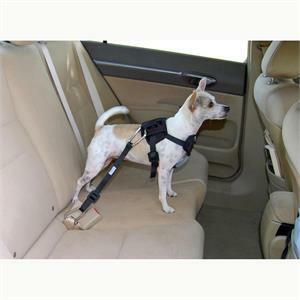 The harness is durable but lightweight and comfortable. Size: Small for pets 10- 25 lbs.